Enjoying Life With 4 Kids: Puppies! 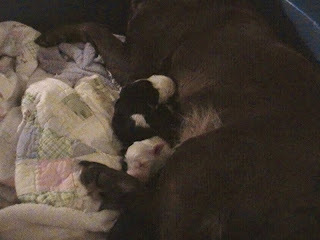 Bailey had her puppies last night. She had a girl at midnight and a boy at 1:30am. They are adorable and look just like Nelson. She is an excellent mommy! Bailey is doing great job! Last Week . . .
Its Looking Like Christmas Around Here!